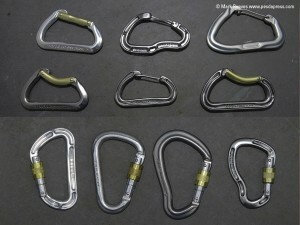 There are many different types of Karabiners. However they can generally be described as snap gate or locking gate karabiners. As we are about to see there are many other sub-type with different pro’s and con’s. 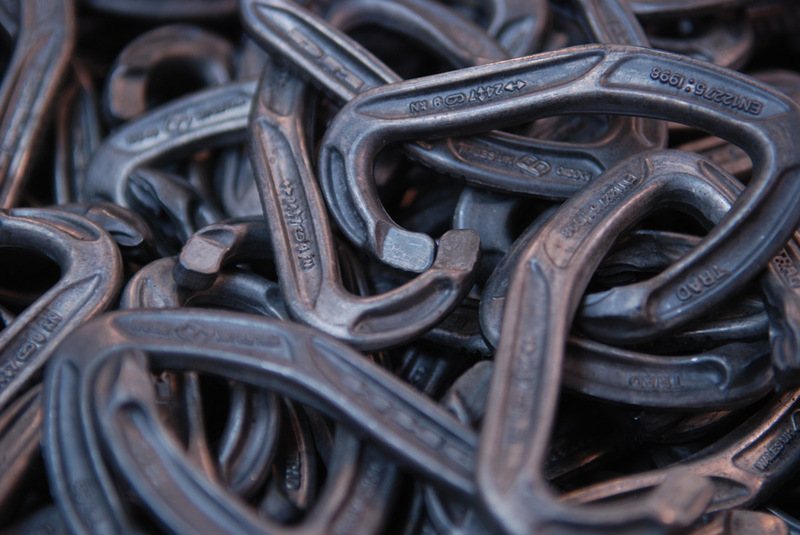 Snap gate carabiners are generally used for leader place protection as it is easier to clip and unclip them whilst climbing. They are also a lot lighter meaning the climber can carry more of them. The generally come whilst either an alloy or wire gate. The alloy gates are a lot heavy and prone to gate chatter as the gate can build its own momentum in a fall. The wire gates are light and less like to open with gate chatter however they can be open much more easily by rubbing against the rock. (See exercise below). Some snap gates are bent rather than straight, these bent gates help you clip the rope into the carabiner. These are very helpful on difficult sports routes where you need to get first time clips in difficult positions. Hit the back bar of a each type of karabiner against your palm. The alloy gate will make a clicking sound, if you do it hard enough. The wire gate won’t. The heavier weight in the alloy gate, means that during a fall the added momentum makes the gate vibrate open and close during a fall. Now run the gates of both types of karabiners alone the edge of a wall. The wire gate catches far easier and is prised open, whereas the alloy gate, require a more sizable notch to open it. Locking gates karabiners tend to come in one of three shapes. D-Shape, Oval Shape and Pear Shaped or HMS. Whilst for general use the D-Shape is great for attaching a rope to protection at a belay the other karabiners have much more specific uses. The locking mechanism can also be a screw gate or some form of twist lock. 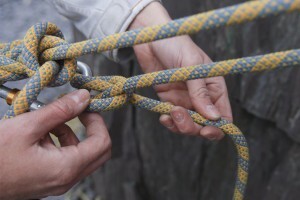 An oval shape karabiner is best used for a belay device, as it is less likely to turn upside down or twist and have the rope running over the gate potentially opening it. 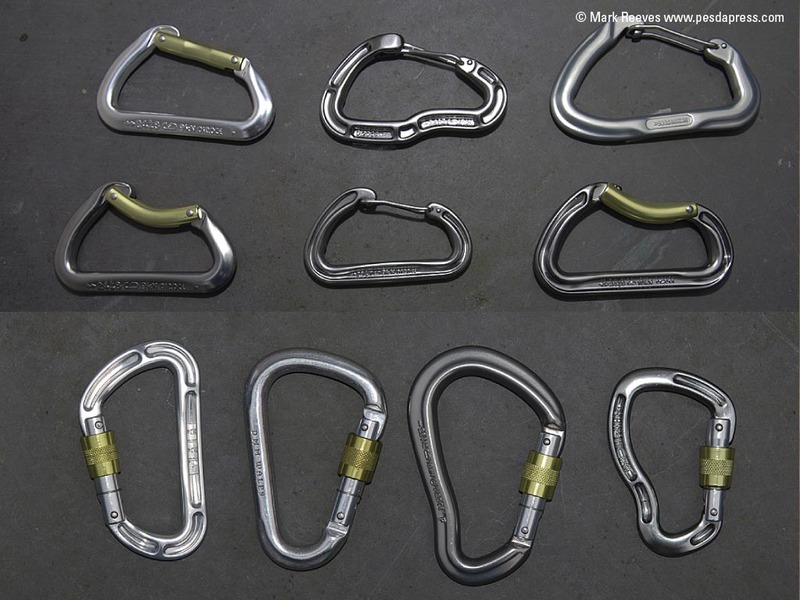 The other type of karabiner recommended for a belay device is a HMS or pear shaped one. HMS or Pear shaped are also very good for using to tie yourself to belays. Especially oversized HMS karabiners that can take two clove hitches ties off to it. Clove Hitch back to a HMS screwgate karabiner.